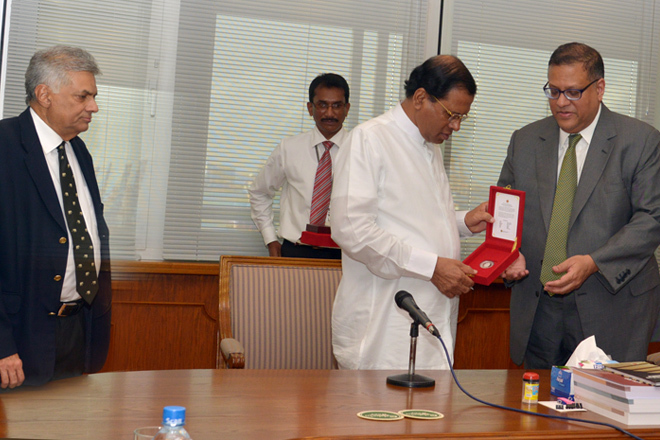 July 15, 2015 (LBO) – Sri Lanka’s President Maithripala Sirisena has visited the Central Bank of Sri Lanka on 9th July 2015, the Bank said today. “Sirisena was accompanied by Prime Minister Ranil Wickramasinghe and jointly received by Governor Arjuna Mahendran, members of the Monetary Board and the senior management of CBSL.” the Central Bank said. A new silver coin minted for the 150th Birth Anniversary of Srimath Anagarika Dharmapala was presented as a memento in honor of the President’s visit to the Bank. President Sirisena making a special statement to the media yesterday said he had suggested that Central Bank Governor Arjuna Mahendran resign following the controversial bond deal. Meanwhile Prime Minister Ranil Wickremesinghe and Finance Minister Ravi Karunanayake have carried out an inspection tour at Chatham Fort Street branch of Sathosa.